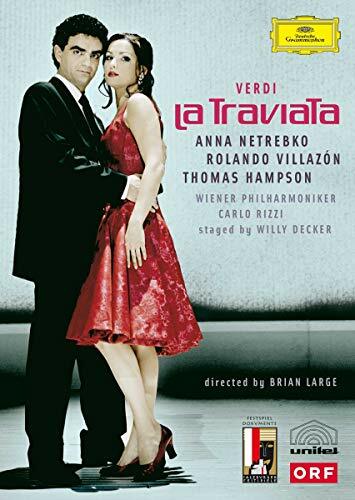 Frankfurt’s production of La Traviata premiered 20 years ago and was one of the last stagins of Axel Corti’s , who died less than two years later. It’s a grand and naturalistic production of the kind you rarely see anymore. A less well-equipped theater wouldn’t be able to pull the extensive sets off, because the scene changes would take too long. The Frankfurt stage crew worked hard and well and never faltered, even in the second act where there are no less than three different scene changes to handle. Corti brings the action to the Paris of World War II. The stage offers a large mansion in the first act, with a big staircase leading to Violetta’s rooms and a huge window at the back, with a night view of Paris under air raids: romantic and destructive… not unlike Tosca herself. The second act begins with a beach scene and a summer house, later we enter that house to find ourselves in a large room, richly furnished and with the paintings in the process of being packed up. Flora’s party takes place in a big, circus-like tent… a scene that doesn’t amount to much. The last act does not take place in the intimacy of Violetta’s apartment but in the waiting room of a train station, where the Gestapo, with its dogs, searching and controlling people. With all this coming and going of people and dogs there is no way to focus on the personal tragedy of poor Violetta, besides the fact that one wonders what the Germonts and Dr.Grenvil are doing visiting Violetta in such a place. C.Rizzi / WPh / Netrebko, Villazon, Hampson et al. The stage direction is remarkable in the first act. When the air alarm sounds, the guests leave the house in a hurry. Violetta sings “E Strano” using the two floors of the house which gives much life to the aria. Flora’s party is quite sloppy and uninteresting and in the last act the director’s good intentions collide with Piave’s libretto and the intimacy that this scene requires. The direction of actors leaves much to be desired. Not in the case of Violetta, as Brenda Rae is a very good actress, but in the case of the Germonts, especially the father (Artur Rucinski), which is too stiff on stage. The musical direction was in the hands of Yuval Zorn, a regular conductor in Frankfurt. His reading started well but lost interest in the second act. There were problems of coordination between stage and pit in the chorus of the gypsies and bullfighters or whatever they were here. The orchestra, meanwhile, performed well. Brenda Rae’s soprano is pleasant, homogenous, well-handled and she knows how to sing while acting. Her Violetta Valéry is very expressive if somewhat light for the character. There is nothing wrong in the first act, but in the scene with Germont she would benefit from a wider middle voice. Her “Amami, Alfredo” was convincing, but lacked drama because her instrument can’t back up the dramatic intentions. She moved the audience with her singing in the last act, even as she was not helped by the production. Singing “Addio del passato” while police dogs sniffing around is, makes it difficult to feel the mood. Korean tenor Alfred Kim (Alfredo)—a 1998 ARD Music Competition winner—turned in a good performance. I still find him rather monotonous in the middle, but it works reasonably well. He sang the cabaletta and he had no problems in delivering the high C.
Young Polish baritone Artur Rucinski who sang Papa Germont is a quality baritone, mostly lyrical, who tends to stay back in the top register. I have heard him previously in Barcelona and Valencia (as Onegin, review here) where he has left a good impression. Germont is about at the limit of what he should sing for now, as heavier Verdi roles don’t strike me as suitable quite yet. His phrasing is quite good and his singing expressive, but he needs someone who can direct him on stage. Throughout the second act he never moved his arms, always hanging on both sides of his body, as if he were an automaton. It would have been good to make him older, too, since he looked more like Alfredo’s brother than his father. Among the secondary characters I liked mezzo soprano Sharon Carty again, this time as Flora. Florian Plock was a good Doctor Grenvil, and there was an interesting Annina in Elizabeth Reiter.